Students of the religion clauses know that one of the most important figures in their drafting and adoption was James Madison. 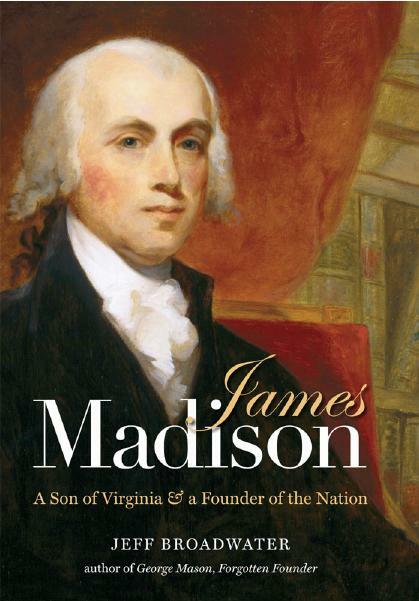 Here is a new intellectual biography of Madison by Jeff Broadwater (Barton College), James Madison: A Son of Virginia and a Founder of the Nation (UNC Press 2012), which focuses in part on his contributions to American constitutional religious liberty. The publisher’s description follows (though the description of Madison as a “systematic political theorist” doesn’t seem quite right to me). James Madison is remembered primarily as a systematic political theorist, but this bookish and unassuming man was also a practical politician who strove for balance in an age of revolution. In this biography, Jeff Broadwater focuses on Madison’s role in the battle for religious freedom in Virginia, his contributions to the adoption of the Constitution and the Bill of Rights, his place in the evolution of the party system, his relationship with Dolley Madison, his performance as a wartime commander in chief, and his views on slavery. From Broadwater’s perspective, no single figure can tell us more about the origins of the American republic than our fourth president.